Located in Cape May County, on the Southern tip of New Jersey, Wildwood is both an eclectic town and a hot spot along the Jersey Shore. With miles of beautiful sandy beaches and a famous two-mile boardwalk, this eastern resort city is very popular with tourists from New Jersey, Pennsylvania and the New York City area. 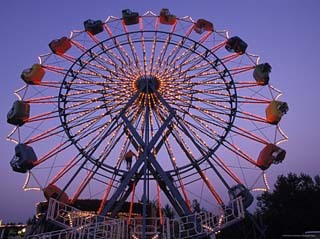 Wildwood explodes during summer months when its population can reach up to 250,000. Family-oriented fun and a mix of activities for people of all ages has made Wildwood stand out among a plethora of shore towns. Enjoying four seasons of weather, with perfect summers and pristine early springs, Wildwood hosts many festivals and special weekends during those hot sunny days. The famous Jersey Shore boardwalk is alive with an assortment of neon lights, delicious treats, souvenir shops and carnival-style games and amusements. Wildwood beaches are growing at a rate of 100 feet per year, making this Jersey Shore beach one of the only places on the East Coast where the shoreline is not diminishing. Chubby Checker initiated "the twist" dance craze at the rocking Rainbow Club in Wildwood in the summer of 1960. Wildwood is home to the Lime Rickey, a tart and popular drink mix with lime as the key ingredient. 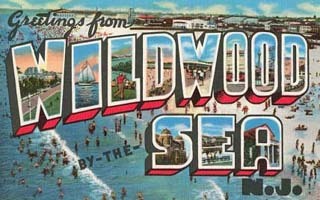 Rock Around the Clock, often thought to be the first rock and roll record, was first performed in Wildwood, NJ. No vacation on the Jersey Shore is complete without a visit to this bustling 2-mile long boardwalk beaming with excitement and adventure! Enjoy five world class amusement piers, two water parks and six roller coasters alongside mouth watering goodies, from roasted nuts and Jersey's own saltwater taffy, to traditional "Boardwalk" fare like pizza, ice cream, cotton candy and fresh, healthy seafood. The Wildwood Boardwalk features amazing rides for children and adults alike, creating wonderful memories and adding the fun factor to any visit to Wildwood. At night the boardwalk comes alive with rock and roll from the dance clubs and music halls along the sands. Of course, one of the main attractions in Wildwood is the mile-long stretch of beautiful beaches, included in the Travel Channel's "America's Best Beaches". These white sandy stretches of paradise await tourists and year-round residents to take advantage of the sun and the fun, including exciting boating, jet skiing, parasailing and camping on the beach under the stars. The town hosts a very popular summer soccer tournament called the Wildwood Beach Blast. The beaches are free to the public, making this New Jersey vacation spot a great idea for day trippers as well. The Doo Wop Motel District, officially recognized as the "Wildwoods Shore Resort Historic District" by the State of New Jersey, is the home of eccentric motels, each with a unique fantasy theme, neon lights, lively colors and a taste for kitsch. Over 50 vintage motels still stand today in the Wildwood Doo Wop, displaying features of novelty architecture, with curvaceous, geometric shapes, upswept roofs and a glitzy glass, steel and neon classical signature. These futuristic designs are now preserved and make for some very unique Wildwood vacation sightseeing!